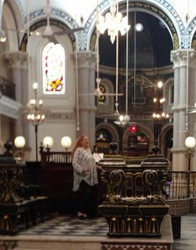 Union of Jewish Universalist Communities Rabbi Ginsburgh Travels to India and leads Shacharit Services at Magen David - a 133 year old Synagogue in Kolkata, India. Rabbi Ginsburgh said, "One of the highlights of the trip was being asked to lead part of the Shacharit Service at Magen David-a 133 year old synagogue in Kolkata." Rabbi Judy Ginsburgh of Louisiana traveled to India to participate in a 15 day "Explore Jewish India" tour. "This was truly a trip of a lifetime", she stated. Rabbi Ginsburgh explains that many American Jews do not realize that at one time there were over 40,000 Jews living in India with complete freedom of worship. Many Indian Jews made Aliyah to Israel in the years following 1948. Rabbi Blane, founder of the Union of Jewish Universalist Communities, stated: "The UJUC is pleased to see the national and international reach of our member Rabbis. We are so proud of the groundbreaking work being done in our communities." Rabbi Ginsburgh was ordained by the Jewish Spiritual Leadership Institute ("JSLI") in 2014 and is a member of Union for Jewish Universalist Communities ("UJUC"). Today, there are only approximately 4,500 Jews still living in India. Sadly, many of the synagogues have become museums and tourist attractions; however, most have been beautifully restored by owners who take great pride in giving tours and preserving India's Jewish history. Rabbi Ginsburgh said, "It was spiritually enriching to visit so many synagogues and visit with so many Jews who are still living in India. There is so much energy and everyone is happy. People are content with what they have; no one is complaining. One of the highlights of the trip was being asked to lead part of the Shacharit Service at Magen David-an 133 year old synagogue in Kolkata." Rabbi Ginsburgh is perhaps best known for her music and work as a cantorial soloist for over 30 years. She has produced a number of award-winning recordings of Jewish music for families and was commissioned by the URJ (Union for Reform Judaism) to write a preschool music curriculum titled "My Jewish World". She has sung and conducted Jewish worship services not only in India, but all over the world. Rabbi Ginsburgh currently serves B'nai Israel in Monroe, Louisiana as their part-time Rabbi. Sim Shalom is an interactive online Jewish Universalist synagogue, which is liberal in thought and traditional in liturgy. Sim Shalom provides accessible and short services every weeknight and Shabbat and additionally Sim Shalom provides online education programs, Jazz concerts, and conversion and life cycle ceremonies. Rabbi Blane is also the founder and director of the Spiritual Leader's Institute, the online professional rabbinical program. Sim Shalom and Rabbi Blane are one of the Founding communities of the Union of Jewish Universalist communities.